This is an amazing long, black and red, mingled skirt. One of the most amazing Gothic skirts we have ever seen! The top of the skirt is in a corset style. It is plain black and includes stitched on straps through silver eyelets. The straps have half circle, silver colored hoops, laced through with black ribbon ending in bows. The corset ends in the same straps but loose hanging. They are attached at one end but detachable at the other with clips so they can be re-arranged if desired. The skirt starts off plain black and then becomes red/black mingle which gives a satin effect. The underskirt is is black voile ending a bit below the top skirt. Generous full skirt. Waist is fully elasticized. Due to the stretchy nature of this skirt, and the fact that the corset lacing can be fully adjusted, this skirt will fit a large variety of sizes! Make sure to adjust the corseting based on your size. This is a Dark Star Premium item. *These skirts came in more adjustable than previous shipments. If you are in the larger range, please adjust the lacing on the outside first, and tie back after putting on the skirt, will comfortably fit up to a 2X! 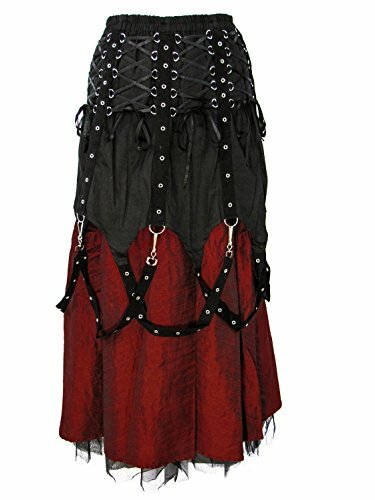 Find more Plus Size Gothic Clothing, Gothic Dresses, Gothic Corsets and more at Mystic Crypt! If you have any questions about this product by Darkstar, contact us by completing and submitting the form below. If you are looking for a specif part number, please include it with your message.